Joan Gable > coffee cups > Happy Halloween! 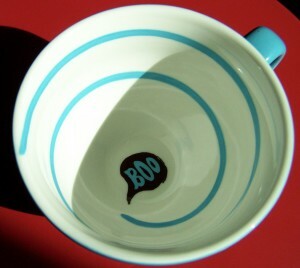 I’ve loved using my Boo cup for the last month. It’s soon to be retired for another year. But on the bright side, that also means I can bust out my Christmas cups in a few weeks. I have a thing for coffee cups. They make me almost as happy as the coffee they hold. This little Boo-cup is a few years old, acquired from Starbucks. 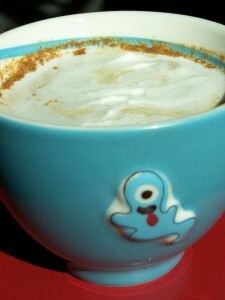 It inspired me to make a home-made pumpkin spiced latte this morning. There are oodles of recipes all over the internet. They all call for real pumpkin and pumpkin pie spice. It turned out rather tasty (smelled awesome, BTW). Using real pumpkin made me feel like I was drinking a health drink – jammed packed with vitamin A! But all in all for me, it just didn’t compare to Starbucks’. I think I will leave this one to the professionals. ← When is number two due?